Definition at line 150 of file ip.h. Definition at line 165 of file ip.h. Referenced by IPAddInterfaceRoute(), IPCreateInterface(), and TCPInterfaceInit(). Definition at line 166 of file ip.h. Definition at line 162 of file ip.h. Referenced by IPCreateInterface(), and LoopRegisterAdapter(). Definition at line 154 of file ip.h. Referenced by IPCreateInterface(), and NBSendPackets(). Definition at line 164 of file ip.h. Definition at line 152 of file ip.h. Definition at line 155 of file ip.h. Referenced by IPCreateInterface(), and PrepareARPPacket(). Definition at line 167 of file ip.h. Referenced by InfoTdiQueryGetAddrTable(), and IPRegisterInterface(). Definition at line 151 of file ip.h. 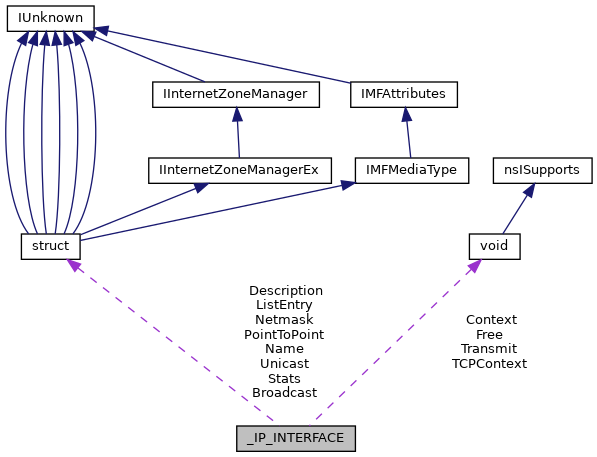 Referenced by IPRegisterInterface(), and IPUnregisterInterface(). Definition at line 153 of file ip.h. Referenced by IPCreateInterface(), and IPRegisterInterface(). Definition at line 156 of file ip.h. Definition at line 157 of file ip.h. Referenced by BindAdapter(), IPSendDatagram(), LoopRegisterAdapter(), RouteGetRouteToDestination(), and TCPInterfaceInit(). Definition at line 163 of file ip.h. Referenced by BindAdapter(), and LoopRegisterAdapter(). Definition at line 161 of file ip.h. Referenced by IPAddInterfaceRoute(), IPCreateInterface(), IPRemoveInterfaceRoute(), and LoopRegisterAdapter(). Definition at line 160 of file ip.h. Definition at line 158 of file ip.h. Definition at line 170 of file ip.h. Definition at line 169 of file ip.h. Referenced by IPCreateInterface(), IPDestroyInterface(), TCPRegisterInterface(), TCPUnregisterInterface(), TCPUpdateInterfaceIPInformation(), and TCPUpdateInterfaceLinkStatus(). Definition at line 168 of file ip.h. Definition at line 159 of file ip.h. Referenced by IPAddInterfaceRoute(), IPCreateInterface(), IPRemoveInterfaceRoute(), LoopRegisterAdapter(), NBCopyNeighbors(), and TCPConnect().